Arsenal Pulp Press, 9781551525501, 272pp. 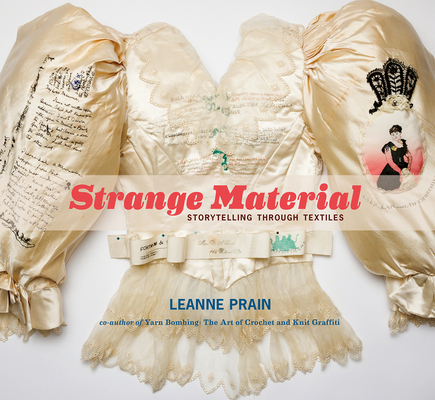 Strange Material explores the relationship between handmade textiles and storytelling. Through text, the act of weaving a tale or dropping a thread takes on new meaning for those who previously have seen textiles--quilts, blankets, articles of clothing, and more--only as functional objects. This book showcases crafters who take storytelling off the page and into the mediums of batik, stitching, dyeing, fabric painting, knitting, crochet, and weaving, creating objects that bear their messages proudly, from personal memoir and cultural fables to pictorial histories and wearable fictions. Full-color throughout, the book includes chapters on various aspects of textile storytelling, from "Textiles of Protest, Politics, and Power" to "The Fabric of Remembrance"; it also includes specific projects, such as the well-known and profoundly moving Names Project AIDS Memorial Quilt, as well as poetry mittens, button blankets, and stitched travel diaries. Offbeat, poetic, and subversive, Strange Material will inspire readers to re-imagine the possibilities of creating through needle and fabric. Leanne Prain is the co-author (with Mandy Moore) of Yarn Bombing, now in its third printing, and the author of Hoopla: The Art of Unexpected Embroidery. A professional graphic designer, Leanne holds degrees in creative writing, art history, and publishing. Leanne Prain: Leanne Prain is a knitter and the author of Yarn Bombing: The Art of Knit & Crochet Graffiti (with Mandy Moore) and Hoopla: The Art of Unexpected Embroidery. A professional graphic designer, Leanne holds degrees in creative writing, art history, and publishing. She lives and crafts in Vancouver, BC.